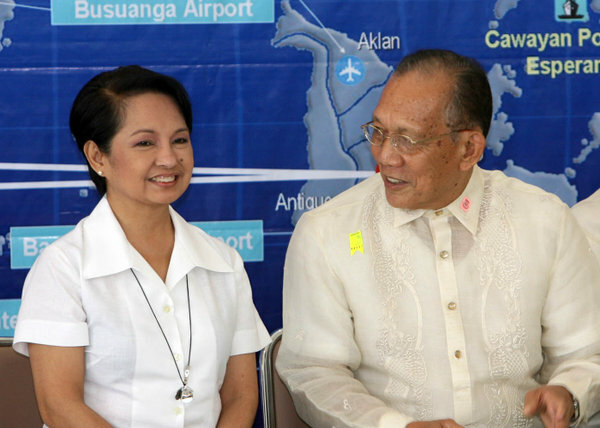 President Gloria Macapagal-Arroyo was visibly elated when the plane carrying her and party made a historic touch down at Runway 20 of the new Iloilo airport in Sta. Barbara-Cabatuan area at about 9:50 am last Wednesday (June 13). Iloilo Gov. Niel D. Tupas, Sr. personally led other provincial officials in welcoming Pres. Macapagal-Arroyo who visited the province to inaugurate the PhP 6.2 billion New Iloilo Airport of Development Project (NIADP) in Sta. Barbara-Cabatuan towns in the Second District. And as if in portents of good things to come, there was no semblance of animosity between Gov. Tupas, a known opposition figure and President Arroyo during the entire proceedings. Clearly, politics was set aside in favor of the greater good for the greater number of people. Gov. Tupas is obviously proud of his new baby, the state of the art airport. He was thankful that no less than President Arroyo led the inauguration with Japanese Ambassador Ryuchiro Yamazaki who also arrived for this event, along with Department of Transportation and Communications Sec. Leandro Mendoza and other cabinet members. Gov. 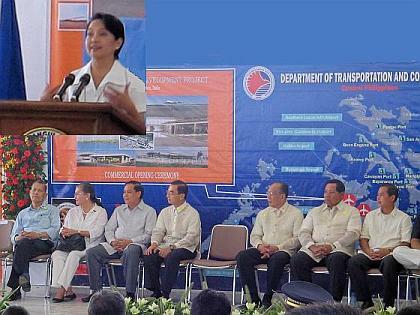 Tupas knew that the new airport could greatly boost the economy of Iloilo especially its tourism industry. The airport, which is a major project under the Super Region, has been realized through the Special Yen Loan Package Agreement entered into by the Japan Bank for International Cooperation (JBIC) and the Government of the Philippines (GOP). Contracted by Taisei-Shimizu Joint Ventures for a project cost of Y9,487,544,058 yen and the GOP counterpart of P1,625,508,763 with the additional amount of P129,985,322. Despite its high cost, the airport is being considered by many observers as the best and the first to have latest technology belonging to Category F as determined by the International Civil Aviation Organization. The NIADP as qualifier for international standards lies on a 188-hectare complex in Sta. Barbara-Cabatuan towns, about 20 kilometers away from the old airport that will be closed down in Iloilo City. It is designed to handle 1.2 million passengers and 11,500 tons of cargoes annually. It has a three-storey passenger terminal building which has been designed to separate departing and arriving passengers. It is equipped with all the facilities needed for a busy and modern airport. There are 10 check-in counters, six X-ray machines, Mabuhay lounges for departing passengers and VIP room, smoking rooms, concessionaire areas for shoppers, lost and found section, counters for hotel and car rental bookings, allocated public telephone booths and other amenities. The pre-departure area is located at the third floor of the terminal building with at least 436 seating capacity. There is also a 1,300 square meter cargo terminal building where the covered platform, government offices, restrooms and cargo handling area are located. It is also in here that the three major airline companies Philippine Airlines, Cebu Pacific and Air Philippines will be housed. The cargo terminal building is being secured by fence with guard house and parking space for clients and operators. The control tower is a 9-storey 35 sq. meters structure that operates and control air traffic for the airport with a 2-storey operation building that houses modern communication equipment and briefing room for pilots. Runway for this airport is 2,500 meters x 45 meters so it could accommodate Airbus 330 with seating capacity of 276. The apron is 48,200 square meters which can accommodate 6 aircrafts at one time. Other structures in the airport complex are the 2-story Administration Building, Maintenance Building and Fire Rescue Stations state-of-the-art navigational aids which would enable the airport to operate after dark, and the runway designation to cater to flights even in bad weather. Ensuring the NIADP to be environment friendly, there is a single story Sewage Treatment Plant that would be the final holding area for the generated domestic sewage. There is also the Material Recovery Facility structure for segregation of the solid waste. Certainly, Iloilo can look forward for more progress and vibrant economic activities with the opening of the airport, which incidentally is one of the priority projects of the President. The ilonggos led by Gov. Tupas has President Arroyo to thank for setting aside politics in favor of progress and development. 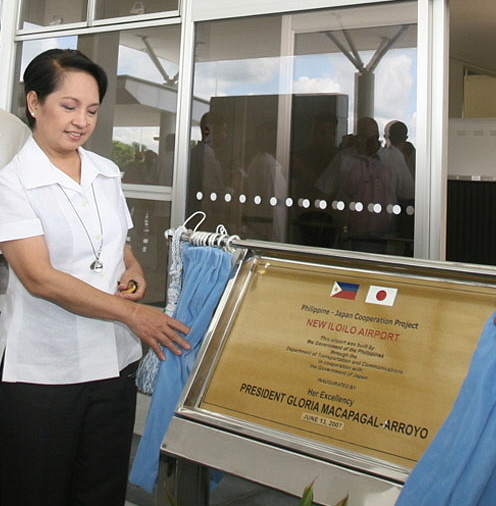 Yamazaki joined President Gloria Macapagal Arroyo at the inauguration today, June 13, of the New Iloilo Airport of international standards located in the municipality of Cabatuan. Aside from the new Iloilo Airport, the government is also set to complete seven other airport projects that would further boost tourism, investment, trade and agriculture. The Japanese government provided the bulk of the funds that went into the construction of the airport to the tune of P6.3 billion from a special yen loan agreement signed in 2000 by the Philippine government and Japan Bank for International Cooperation (JBIC). The total cost of the project amounted to P8.759 billion including the Philippine counterpart. Citing the closer bilateral ties, Yamazaki vowed that Japan shall continue to help in strengthening the Philippine economic structure towards sustainable growth. The two governments have come up with a bilateral agreement called the Japan-Philippine Economic Partnership Agreement (JPEPA) that calls for the promotion of closer economic ties between the neighboring countries. Japan is presently the country’s second biggest trade partner. He said he is happy to note that the Philippine government decided to push through with the airport facility as it would help Iloilo meet the growing demand for air transport in the island of Panay. He cited recent statistics which showed that the old Iloilo Airport had the fourth biggest volume of passengers last year next to the Ninoy Aquino International Airport and the international airports in Cebu and Davao. He also considered the completion of the airport as another success story of Japanese Official Development Assistance (ODA) to the Philippines in cooperation with the Philippine government’s efforts towards poverty alleviation and mitigation of regional development disparities. He said the project is one of the examples of the comprehensive partnership between the Philippines and Japan towards promoting our bilateral relationships which are better than ever before. Existing diplomatic and trade ties between the two governments have resulted in the implementation of various joint projects in the Philippines in the areas of agriculture and support infrastructure. The inauguration signaled the start of the commercial operations of the new airport starting June 14 and the closure of the old Iloilo Airport in Mandurriao district. ROXAS CITY (14 June) -- The New Iloilo Airport (NIA) of international standard, which was inaugurated by President Arroyo June 13, will augur well for a higher level of development in the Island of Panay which comprises the provinces of Iloilo, Aklan, Antique and Capiz. This was the gist of the remarks made by Japanese Ambassador to the Philippines Ryuichiro Yamazaki at the inauguration of the P8.759-billion new airport facility which the Government of Japan helped build under a special yen loan package agreement. The loan agreement was signed on August 31, 2000 by the Philippine government and Japan Bank for International Cooperation (JBIC) in the amount of 14.7 billion yen. In his message, Yamazaki said he was happy to note that with the new airport, which is located in Cabatuan, Iloilo, the island of Panay has acquired a new basis for future growth. He said airports and air transport are vital to the development of island communities, serving as a gateway for transporting people and goods. Since it is also used sometimes by people from other provinces in the island as well as those from the island province of Guimaras, the Iloilo Airport, then located at its old site at Mandurriao, Iloilo City, handled the fourth biggest volume of passengers in 2006 next to the Ninoy Aquino International Airport and the international airports in Cebu and Davao. The higher passenger volume at Iloilo Airport reflects a 50 percent increase over the last ten years. Thus, there is a need for a bigger and more efficient airport to meet the growing passenger volume, the ambassador said. 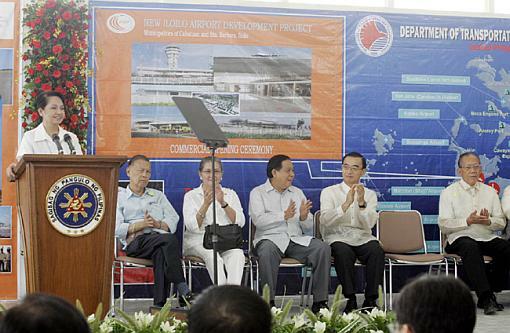 The new Iloilo airport is one of the 31 priority airport projects that the government has lined up to complete under the Medium-Term Public Investment Program as part of President Arroyo's overall development agenda and to support the development of the country's five Super Regions that would spur tourism, investments and agriculture. Yamazaki said the completion of the new airport is another success story of Japanese Official Development Assistance (ODA) program in the Philippines in cooperation with the Philippine government's efforts towards poverty alleviation and mitigation of regional disparities. He also vowed that Japan shall continue to help in strengthening the Philippine economic structure towards sustainable growth. CABATUAN, Iloilo – Iloilo province on Wednesday formally opened its doors to world air traffic with the inauguration of its brand new P8-billion international airport on a 188-hectare straddling Sta. Maria and Cabatuan towns. 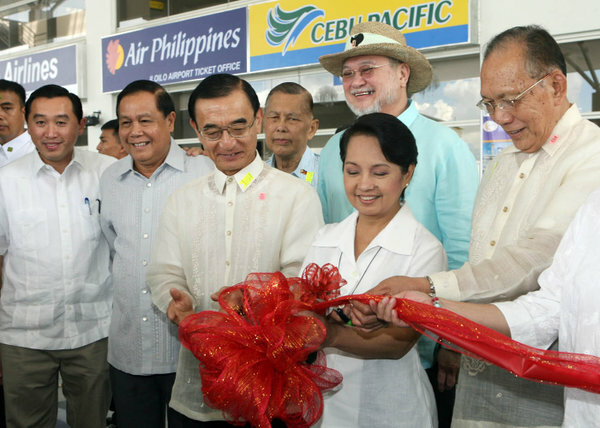 President Gloria Macapagal-Arroyo, who led the opening of the air terminal, described the new airport as a "shining example of the best that is still to come for all the Filipino people" as the country continues to break loose from its "lethargic economic legacy." The new airport, she added, is a "symbol of our collective will and the people’s support." The President lauded the Ilonggos for their steadfast commitment to the project despite the magnitude of the challenges posed by lack of funds. She said plans for the upgrading of the Iloilo airport started in 1997 when the whole of Southeast Asia was reeling from the effects of the financial crisis gripping the region. But with "concerted efforts and the faith of all the Ilonggos, we concentrated on completing it (Iloilo International Airport) on time," she added. "We broke the back of our lethargic economic legacy via a combination of tough fiscal measures and equally difficult political decisions to make more revenue," the President said. She was referring to the Expanded Value Added Tax (EVAT) Law which raised the tax on goods and services from 10 percent to 12 percent. The additional taxes enabled the government to raise funds needed o implement vital physical and infrastructure projects, including the Iloilo international airport. The President assured the Ilongos that her administration would continue to focus on pro-growth, pro-trade and pro-investment strategies "that will lift our people from poverty and make the Philippines a real investment destination." 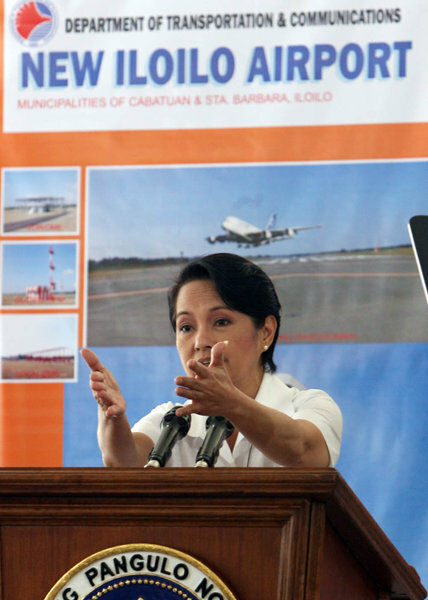 "And with this Iloilo airport here, Iloilo is also in contention as a major investment destination," she said. Iloilo's tourism industry will greatly benefit from the opening of the IIA, as well as the agriculture and business sectors. A joint project of the Philippines and Japan, the IIA was funded under Japan’s Overseas Development Assistance (ODA) program through the Japan Bank for International Cooperation (JBIC) which put up P6.3-billion, while the Philippines raised P1.625- billion as its counterpart fund. The IIA is designed to handle 1.2 million passengers and 11,500 tons of cargo a year. The three-storey passenger terminal building has an area of 13,500 square meters. It has 10 check-in counters with individual weighing and queuing conveyors, belt conveyors from check-in to baggage loading area, flight information display system to guide passengers on the aircraft's time schedule and destination and a transit counter. The cargo terminal building is a 1,300-square meter single storey structure, consisting of a covered platform, government offices, restrooms and cargo handling area. The control tower is a nine-storey structure with a two-storey operation building that houses state-of-the-art communications equipment and briefing room for pilots. The new airport replaces the old passenger terminal in Mandurriao, some 20 kilometers away. Thank you, Congressman Art Defensor. It's just so appropriate that you would introduce me not only because we are now in your district but also because you conceived of this Iloilo airport when you were governor of Iloilo. Congratulations! Ambassador Yamazaki, thank you so much. Through you, to the Japanese government for the loan that only charged 0.9 percent so that we could build and complete this airport. Governor Niel Tupas, congratulations! If Governor Defensor conceived of the airport, you gave birth to this airport. Congresswoman Judy Syjuco, congratulations! Also because while this terminal is located in the district of Congressman Defensor, the entrance to the airport, the access to the airport is in your district. Congratulations! I would like to also greet our other congressmen who are here today from the other districts. We have Congressman Ferj Biron and we have Congressman Jun Gonzalez. And not only from the other district but from the other island, Congressman Monico Puentevella, looking forward also to the day when we inaugurate the Bacolod airport in August. May I greet the mayors who are here especially Mayor Ramon Yee of Cabatuan. We are right here in his jurisdiction. And all the other mayors and board members of Iloilo who are here today including the mayor of Iloilo City Jerry Treñas. This was a beautiful story. When I was riding in the plane with Congressman Defensor and we were having our private meeting on the briefing, he told me the story of how the Iloilo airport was conceived and how finally it was born. 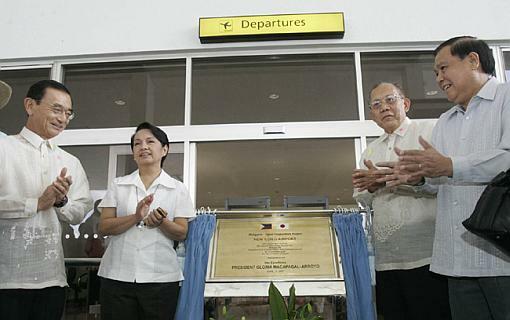 When he was governor about 1997 or so, there were some Japanese consultants who came and said that Japan might be interested in funding an airport but they were choosing among several airports to modernize or to upgrade and one of the rivals was Bacolod, and at the end of the day Bacolod was chosen. Then came the Germans, KFW, because they like the fact that this used to be already a Japanese airport, air force airport. Therefore, technically, technical, technically it was very suitable for an airport and an airport of international standards. So the feasibility study was made and submitted to the KFW of Germany for funding. And it was offered to be funded by KFW. But at that time KFW was offering six percent interest which should have been prohibitive given our very, very bad fiscal condition at that time. And during one of the meetings that then... Already Congressman Defensor had already in our administration with the DOTC trying to find a way to fund this airport, one of the senior personnel of the DOTC whispered to him, there is still some leftover of Obuchi fund and we may get it for one percent. Actually, the Philippines is the biggest user of the Obuchi fund, incidentally. And so when it was submitted to the Obuchi fund it was approved during our administration not at one percent interest but at 0.9 percent interest. And now this airport is born. Nagapasalamat gid kita sa mga congressmen, mga senador, gobernador, mga LGUs sang probinsya na nagpakusog para matapos dayon ining atong airport. Congratulations! Sa mga pumuluyo sa cabatuan kag Santa Barbara. Sa duha ka banwa nga ini naghalin ang 188 hectares nga ginasakop sang Iloilo airport. Mga kasimanwa ko diri sa Iloilo tapos na gid ang dugay nato nga ginhulat. Tatlo ka tuig ang nagligad halin sa pagkari kita sa groundbreaking. If you remember in January 2004... Oh! 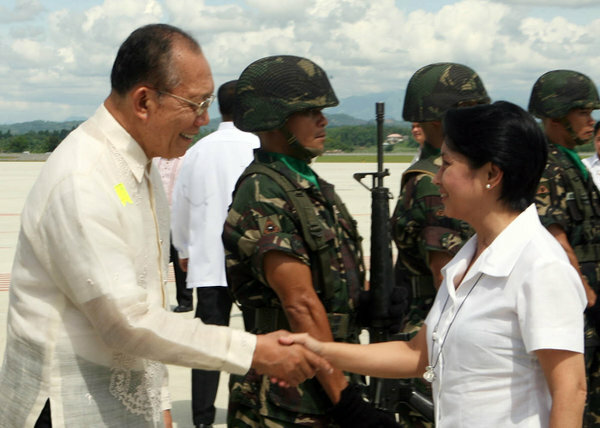 Let me also greet Governor Sally Perez from the neighboring province of antique. You were also there in the groundbreaking. Subong ari na ang bag-o nga airport. May state-of-the-art nga galamiton kag moderno nga passenger terminal building. In fact, Secretary Mendoza says this is the most modern and most beautiful airport in the Philippines today. This is a symbol of our collective political will and the people's support. We're also pleased that preparations to bid out the old airport in Mandurriao are underway. I was asking Secretary Mendoza, what is the status of the Mandurriao airport, because we need to fund the servicing of this airport. We need to fund the serving of the loan on the airport and we want to get it from the privatization of the Mandurriao airport. And his report is that there was a failed bid because the three bidders: Gokongwei, SM and -- no, no. Ayala did not join -- bank of South Asia did not submit any bid higher than 800 million pesos and the floor price is 1.2 billion pesos. So now the department of finance is the one, Larry? Who will ask them to which... Whoever one of them will be able to upgrade their bid to 1.2, at least 1.2, then the one that gives the best offer will be the one that will be chosen. But since the bid failed, even outsiders now can come and say, "hey! I can give it to you for 1.2 billion." I'm recounting this to you in the interest of transparency so that you all know where we are. And because leading funds for this project was not easy -- in the past the national government's earning were barely enough to service payments for our ballooning debts -- seeking soft loans at that time of fiscal crisis loomed... Looming in our horizon demanded the combined efforts of all. But we were not deterred by the magnitude of the challenges, with concerted effort and the faith of all the Ilonggos, we concentrated on completing it on time. In fact, Larry Mendoza says that this is one of the fastest construction periods for an airport of international standards. From January of 2004 to June of 2007 is barely 30 months. Tough and timely decisions, and long and hard work have made our dream come true. And the results are here for all the world to see. This is a shining example of the best that is yet to come for all the Filipino people. We broke the back of our economic lethargy... Our lethargic economic legacy by a combination of tough fiscal measures and equally political and difficult decisions to make more revenue. Our economy has reached a new level of maturity with some of the strongest fundamentals in a generation. I thank our congressmen for making those tough decisions to raise revenue. And as Niel Tupas says -- although Frank Drilon is not here today -- we acknowledge that he was the senate president during that time when those difficult revenue measures were passed. Now, that we have the revenue, and now that compared to before when we were looking and looking for who could lend money. Now that creditors are all coming, offering us to fund various projects, our administration will focus on pro-growth, pro-trade and pro-investment strategies that will lift our people up from poverty and make the Philippines finally in contention as a real investment destination. And with this Iloilo airport here, Iloilo is also in contention as a major investment destination. Indi lang investment, mas madamo na gid ang turista nga maka-ari kag makita sa katahom sang iloilo kag Guimaras. Ginsuguran na ang road widening sang kalsada nga Iloilo City-Cabatuan, and Congressman Art Defensor said that we should also work on asking the DPWH, since our regional director is here, to examine how much it would cost, so we can have the Cabatuan to Calinog airport as well. Asphalt overlay. Kinahanglan pa nga kaayuhun ang iban dalan pakadto diri sa airport. Because we want this to be the hub of new economic development. And as I said earlier, Iloilo is not just now an area for investment and tourism but still an important area for agriculture. Of course Iloilo is no longer number one in rice production. Nueva Ecija is number one in rice production. Nonetheless, Iloilo with this airport will really have a new source of great income and that is tourism. But we still want your production to continue, not necessarily because... Or agricultural production, not necessarily because we want you to remain an agricultural country -- we want you to become a tourism country -- but because we want you as much as possible to be self-sufficient in your food production including the servicing of the food requirements, the food and beverage requirements of the various tourist areas that are sure to come up with this Iloilo airport. I was telling Arty and art in the plane that when I go to Boracay, it's very sad to buy souvenir products that come from Indonesia or made in China. I mean, if you buy a sundress, why does it have to be a batik sundress. Why can't it be a Hablon sundress or an Iloilo silk sundress. You know, things like that. And why did they have to import their vegetables for their salad from Baguio and Benguet. Why can't they not produce it in the highlands of Iloilo. And so this is what we would like to see in the years to come. I was also telling them the story of Bali. I don't know the size of Bali but I have the impression it's about like Iloilo. But Bali started with Kuta, that little beach there that is like the Boracay of today -- actually, Boracay is more beautiful -- but from Kuta development has spread throughout the whole Bali. And you have many other beaches now outside of Kuta. But it's not only the beaches that makes Bali so attractive. One is the accessibility. Because you can fly straight to Bali from Australia. You don't have to fly to Jakarta, you can bypass Jakarta. Well, that will be solved because you can now fly straight from some Asian capital to exactly to Iloilo. In fact, again in the interest of transparency, I'd like to announce that the DOTC and the C.A.B. have just finished their negotiations with the government of Korea for 19,000 new seats, airline seats, because Korea's make up one-fourth of all our three million tourists. And Secretary Mendoza told me that he will... In granting the actual licenses to fly into the country, he will assign several of the applications to land right here in Iloilo airport. And so when all those things happen then... And tourism grows, then we want to be like Bali. Everything coming from here. Food coming from here. Restaurant food, hotel food coming from Panay Island to include Antique because sally is here. Actually, sally is benefiting from Boracay tourism because some of the resorts are already in Northern Antique. But we also want the souvenirs to come from here. So with this airport ang isa pa na kinahanglan naton padamuon pa naton ang produktibidad sa aton mga vegetables and even our nice consumer products that can be sold in the tourist shops for souvenirs. Because tourism earns for Spain more than oil earns for Saudi Arabia. And this Iloilo airport is really a symbol of the future direction of Iloilo and Panay province, and even of the Philippines. The Philippine economy is stable and strong. And we can say after the last elections, how peaceful it was. How stable the path we have set for economic reforms has not been upset by partisan elections. And if you want proof of that statement, just look at the ones who are here in this platform today. From different contending parties in the last elections, we are all together for the future of Iloilo, Panay Island and the Philippines. Gani subong nga natapos na ang eleksiyon ibalik naton ang focus para mas magdako pa ang ekonomiya. And so that is the message of this Iloilo airport. We all went through tough times to conceive and to give birth to this airport. Let's be together to make it grow and reach its fulfillment for the good of Iloilo, Panay Island and the Philippines. Damo gid nga salamat kag mabuhi kita tanan! Cabatuan, Iloilo (12 June) -- The New Iloilo Airport which will be opened for commercial flights starting June 14, is a modern 188-hectare complex located in the towns of Cabatuan and Sta. Barbara, Iloilo, about 20 kilometers away from the old airport with state-of-the-art facilities. It is designed to handle 1.2 million passengers and 11,500 tons of cargoes per year and can accommodate aircraft as big as Airbus 330 with a seating capacity of 276. The airport is accessible via the three-kilometer lane asphalt paved main access road connected from the bend at Sta. Barbara, with a 2.5-meter center island barrier planted with a variety of palm trees, eucalyptus among others. It has 82 double arm lampposts for lighting purposes. The three story passenger terminal building has an area of 13, square meters, designed with complete separation for departing and arriving passengers. It has 10 check in counters with individual weighing and queuing conveyors, belt conveyor from the check in to the baggage loading area, flight information display system to guide passengers of the aircraft's time schedule and destination, and a transit counter. The terminal is also provided with close-circuit television for security and monitoring purposes; and three units of passenger boarding bridges, which can stretch up to 35 meters when fully retracted. The boarding bridge is accessible via a separated gang-way (one each for departing and arriving passengers). 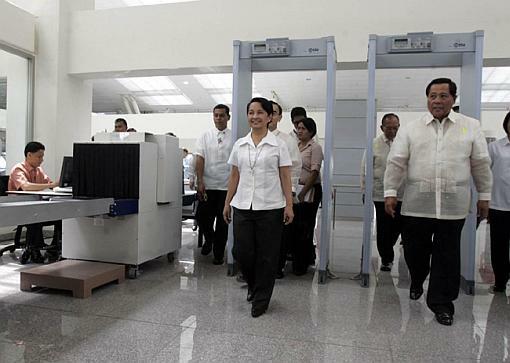 Other amenities of the building includes 6 x-ray machines, Mabuhay lounges for departing passengers and VIP room, smoking rooms, concessionaire areas for shoppers, lost and found section, counters for hotel and car rental bookings, allocated public telephone booths and others. The facilities are guaranteed to be handicapped friendly, with railings, elevators, escalators and dedicated space for handicapped in the comfort rooms. The pre-departure area is located at the third floor of the building, with at least 436 seating capacity. The baggage claim area is located at the ground floor, accessible from the second floor with two units of 51 meters conveyor. There is also a separate section for the waiting public and well wishers at the arrival and departure concourse. In front of the Passenger Terminal Building is a vehicular parking area with 414 slots for private cars, complete with tollbooth and a drivers' lounge and rest rooms. Spaces for taxi, buses and jeepney stands are, likewise, provided. The airport's Cargo Terminal Building is a 1,300-square meter storey structure consisting of a covered platform, government offices, restrooms and cargo handling area. It is now being occupied by the 3-airline companies, namely, the Philippine airlines, Cebu Pacific and Air Philippines. The area is secured by fence with guard house and parking space for clients and operators. The Control tower, on the other hand, is a 9-storey 35 meters structure that operates and control air traffic for the airport, with a two-storey operation building that houses the state-of-the-art communication equipment and the briefing room for pilots. For better and efficient operations, and maintenance, the mechanical and electrical buildings were constructed separately. The mechanical building houses the chiller room, and water supply and pump room, while the cooling system for the whole airport is about 2,400kw, consisting of five units of chillers, each having a capacity of 600kw. On the other hand, the entire electrical system of the airport can generate 2,500kVA supply of power, while the generator room is equipped with 4 units of 500kVA standby generator and automatically switch-on during power failure. Other buildings and facilities in the airport include the 2-storey Administration Building, Maintenance Building, and Fire Rescue Stations state-of-the-art navigational aids which enable the airport to operate after dark, and the runway designation designed to cater to even bad weather conditions. The Airport's environment friendly facilities include a Sewage Treatment Plant, a single storey structure considered as the final holding area of the generated domestic sewage. During the treatment process the solid waste is separated from the liquid and process into an organic material (fertilizer) for the plants, while the liquid is recycled for watering purposes. There is also a Material Recovery Facility (MRF) structure for the segregation of the solid waste collected in the airport. 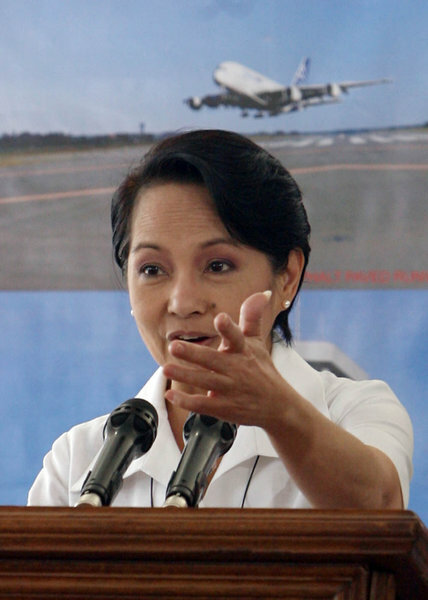 Iloilo (13 June) -- President Gloria Macapagal Arroyo said the New Iloilo Airport is the symbol of “our collective political will and the people’s support”. Speaking during the inaugural rites of the newly completed P8.759 billion New Iloilo Airport of international standards, the President said “it was the most modern and beautiful airport in the Philippines today with its state-of-the art facilities and modern passenger terminal building”. The President said it was Congressman Arthur Defensor, former Iloilo Governor who conceived of the project and it was the administration of Governor Niel Tupas who finally gave birth to the project. For the Ilonggos, the much-awaited moment had finally come and the province of Iloilo and its neighboring provinces have now its own airport of international standards and with it anchors their aspiration to rapid economic growth. According to the President the construction period of the New Iloilo Airport was one of the fastest construction for an airport of international standards, with barely thirty months construction. 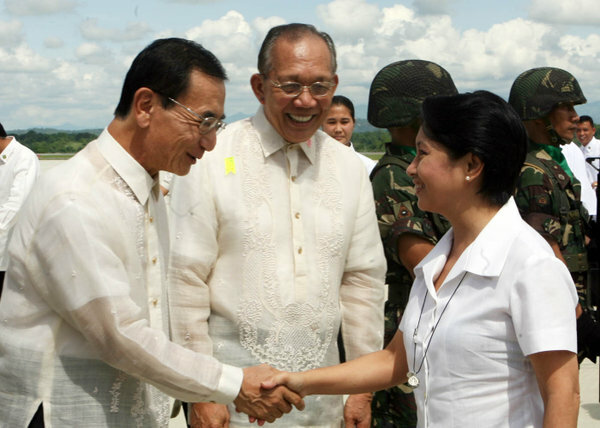 The President herself led the groundbreaking ceremonies last January 2004. 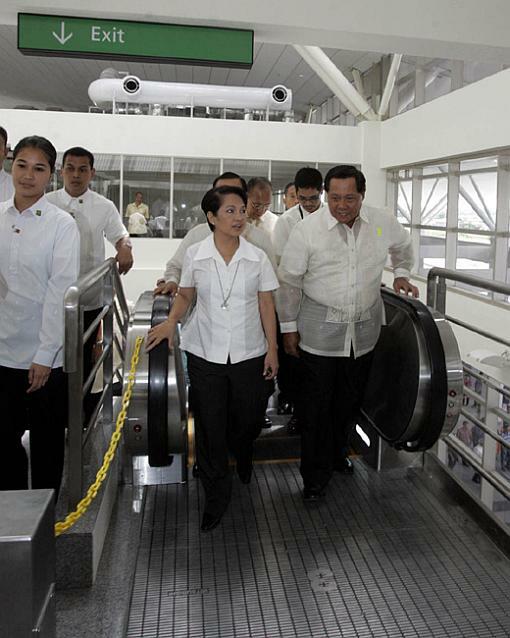 The New Iloilo Airport is a modern 188-hectare complex located in the towns of Cabatuan and Sta. Barbara, Iloilo, about 20 kilometers away from the old Mandurriao airport. It can handle 1.2 million passengers and 11,500 tons of cargoes per year. The President said the New Iloilo Airport is a shining example of the best that is yet to come for all the Filipino people as the back of the economic lethargy has been broken by a combination of tough fiscal measures and equally politically difficult decisions to make more revenue. “In the past the national government’s earnings were barely enough to service payments of our ballooning debts, seeking soft loans at that time of fiscal crisis, looming in our horizon demanded the combined efforts of all but we were not deterred by the magnitude of the challenges, with concerted effort and the faith of all the Ilonggos we concentrated on in completing it on time” the President said. “Our economy has reached a new level of maturity with some of the strongest fundamentals in a generation”, said the President as she thanked the Congressmen and Senators for making the tough decision to raise revenues. President Arroyo said now that we have the revenue, creditors are coming and offering to fund various projects her administration will focus on particularly those on pro-poor, pro-growth, pro trade and pro investment strategies that will lift the people up from poverty and make Philippines finally in contention as a real investment destination. With the New Iloilo Airport, she said, Iloilo is also in contention as a major investment and tourist destination. Iloilo City (2 March) -- Zest Air will expand its operations to include the island of Panay in its route starting March 16, 2009. In an interview with Philippine Information Agency, Iloilo Airport (IA) Acting Airport Area Manager Efren Nagrama said the company is set to deploy an Air Bus 320 to service a daily flight from Manila to Iloilo. Nagrama said with the addition of Zest Air there will be now four commercial airline companies that will service domestic flights in the Iloilo Airport. The other three airline companies are Philippine Air Lines, Air Philippines and Cebu Pacific Air. The Iloilo Airport serves as a gateway for air travelers to Iloilo, Guimaras, Antique, parts of Capiz and the province of Aklan where Boracay, the country's top beach destination, is located. 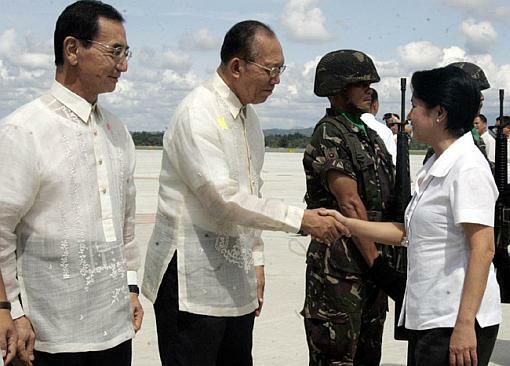 President Gloria Macapagal Arroyo inaugurated herself the P8.759 billion Iloilo Airport located at Cabatuan, Iloilo, last June 14, 2007 as one of her major economic and tourism infrastructures in this part of the country. It will be recalled that Western Visayas along with Bicol, Eastern, and Central Visayas, Mindoro Palawan,Romblon, Camiguin and Siargao comprised the Central Philippines which was designated as the centerpiece tourism development in the country. The record of the Civil Aviation Authority of the Philippines based at IA indicated that in 2008 alone, more than one million passengers were flown in and out by Philippines Air Lines, Air Philippines and Cebu Pacific Air out of the 9,357 flights during the period. With the operation of Zest Air, Nagrama said, more business, economic and tourism opportunities will be opened to the region.